Stimulating, insightful, entertaining, fun. For goodness sakes it’s Socrates. What else could it be. Using Jowett’s translation. The performers are excellent and enrich the reading of the dialogues. I enjoyed immensely all of these dialogues translated by Benjamin Jowett and performed superlatively by David Rintoul. 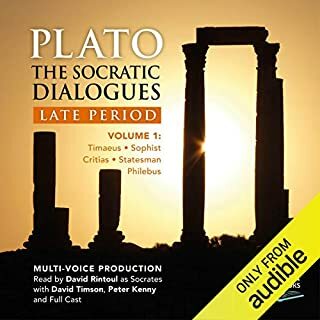 Very highly recommended for those who seek an existential edification and a philosophic understanding of Ancient Greece as exemplified by the insightful writings of Plato in the character of Socrates his great teacher. Socrates said true wisdom is knowing that you don’t know. Find out what you don’t know by self and other examination! 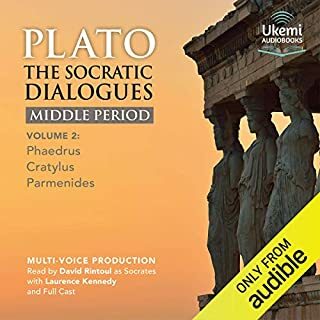 Rintoul’s performance in the character of Socrates is sheer brilliance, along with a great cast of supportive actors. Each Dialogue is briefly introduced with the characters and setting that are involved. 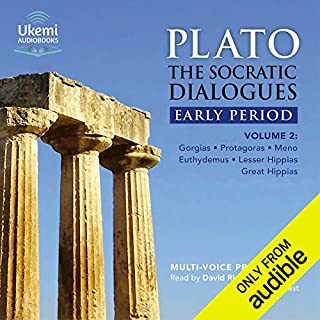 I’m on to the next set of Dialogues in the order that they were supposedly written. 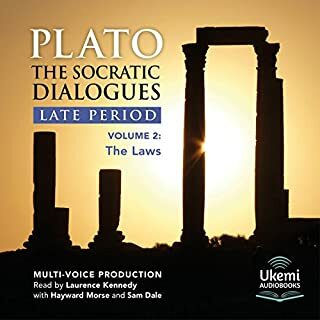 The works of Plato, along with Shakespeare and Dostoevsky are my three books that I would take with me on a stranded desert island.